Snow-Camp has clinched a partnership with Les Hôtels d'en Haut hotel group, offering internships for two aspiring young Snow-Camp apprentices in Val Thorens. 17 year old Zulekha Dennis and 18 year old Hamza Alkebida have been selected as Snow-Camp's representatives in a new internship programme. 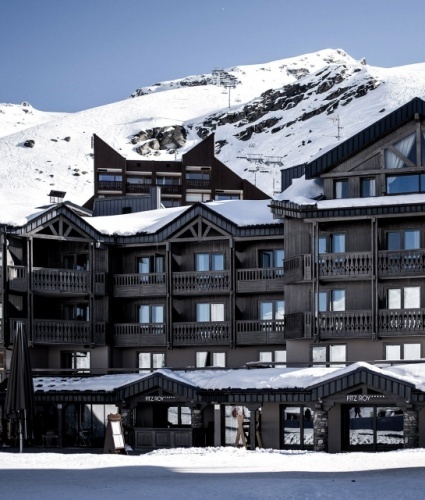 They will join the five-star hotel Le Fitz Roy in Val Thorens as Ski Valets for the winter, putting into practice some of the skills they have learnt with Snow-Camp. They will experience the demands and challenges of a five-star ski resort in the luxury hospitality industry and will be responsible for assisting guests in the 58 room hotel, throughout their stay on the slopes. The two Londoners are a talented and a committed pair, both fired up for the winter ahead. 17 years old Zulekha Dennis from Streatham, London, told PlanetSKI, "I am so lucky to be given this opportunity and I can't wait to get out to the snow." She first became involved with Snow-Camp when she was 14 and learnt to ski at the Snow Centre in Hemel Hempstead. Through the Apprentice programme she completed a work placement with retailer, Ellis Brigham, and is now a qualified boot fitter and a ski instructor as well as being a youth ambassador to youngsters joining the Snow-Camp programme. 18 year old Hamza Alkebida is both a ski instructor and a snowboard instructor and he told PlanetSKI, "Getting my (snowboarding and skiing) qualification is the best thing I have done." On joining the Snow-Camp programme, Hamza found a new sense of ambition and was determined to excel in snowboarding. His strong desire to succeed helped him to progress through the Snow-Camp programme stages: First Tracks, Graduate and Excel, resulting in a qualification as a Level 1 Snowsport England Snowboard Instructor as well as a Snowsport England Snowlife Award and an ASDAN Level 1 in Health and Fitness. Dan Charlish, Founder of Snow-Camp is thrilled with the collaboration with Les Hôtels d'en Haut. He said, ‘‘We're so proud to be partnering with Les Hôtels d'en Haut. They are offering our young people an amazing opportunity to build on the skills they've learnt with Snow-Camp that will help them go onto securing successful careers in the ski industry." In turn 'collaboration' is at the very core of the up market hotel group, Les Hôtels d'en Haut, and they too are delighted to be partnering with Snow-Camp, helping even more young people further develop their skills. Valéry Grégo, Founder of Les Hôtel's d'en Haut was delighted to be partnered with Snow-Camp and commented the partnership would be on going. She said, "We are delighted to be partnering with Snow-Camp on such an exciting and worthwhile project." "Seeing their amazing work and their dedication to changing lives made us jump at the opportunity to be involved in any way we could." Snow-Camp is the UK's only registered charity using a combination of snowsports, life skills sessions, qualifications and vocational opportunities to support inner city young people. Snow-Camp first launched in London in 2003, before expanding nationally over recent years. Over the last 15 years the charity has supported over 10,000 young people across the UK. The charity achieved their last national campaign target (the 5NOW expansion plan) to be running Snow-Camp programmes across five UK cities by 2018. To date, Snow-Camp has launched in London, Bristol, Scotland, Cardiff, the Midlands and Manchester.